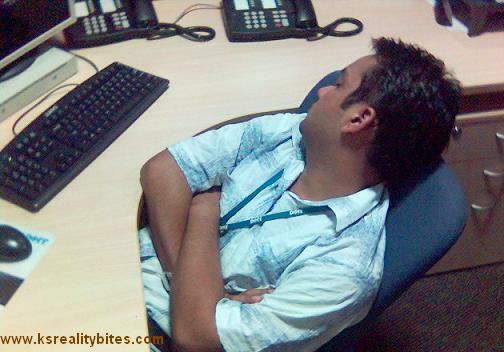 KSRealityBites: Lack of sleep affects employees performance! Lack of sleep affects employees performance! A latest survey by the industry body Assocham says that the sleepless night, which is caused by extended working hours & high-stress level, affect the employees' performance at workplace! The chamber conducted a survey among people, who are working in sectors like Information Technology, Energy, Telecom & Consumer durables in major cities including Delhi, Kolkata, Mumbai & Chennai. While observing the World Health Day on April 7, the chamber said that 78% of employees of the above mentioned sectors used to sleep less than six hours at night, which lead to depression & fatigue, which further affect their performances at the workplace. D S Rawat, Assocham Secretary General said that less sleep leads to fatigue, physical discomfort, irritation, stress & depression, which pose as a biggest hindrance to their success. The survey showed that maximum numbers of insomnia cases were reported in major cities. Among the cities, the capital Delhi ranks first followed by Mumbai, Ahmedabad, Pune, Chandigarh & Chennai. However, the chamber did not mention that the survey was conducted on how many respondents. The study said that most of the respondents complained of obesity. The poor & hectic lifestyle causes hypertension, stress & depression. About 40% of corporate employees were found not exercising on daily basis. So to drain stress, depression & hypertension like problems regular exercise is a must which may be a simple stretch out to common yoga positions. Above all in order to keep your performance well better than the best, all you need to do is not to skip your sleep which is a must for every human being plus you should give your brain a little rest (at least six hours is a must) in order to improve your performance on top so that you could concentrate very well on your work.